Home » News » The Bike Shed 2017 in London - we are part of it! The Bike Shed 2017 in London - we are part of it! This year Öhlins DTC will have a presence at the Bike Shed custom show. It will be our first time and we are excited to see awesome bikes, meet nice people and have a very good time in London. The Bike Shed – one of Europe's best independent annual motorcycle show, on the last bank holiday weekend in May, celebrates the creativity of the new-wave and cafe-racer custom motorcycle culture, with over 150 curated custom motorcycles, plus live art, photography, and hand-made accessories, alongside selected brands, retailers and exhibitors. Set in London's historic and beautiful Tobacco Docks the event is also famous for its superb hospitality with high quality, healthy street food, barista coffee, several proper bars, cigar & whisky lounges, live music, plus multiple live tattoo artists and a multi-chair traditional barbershop. The Bike Shed is an exhibition in a giant pop-up members club, where everyone is invited. The exhibited bikes are selected from the best bike builders in the UK, Europe, and the US. 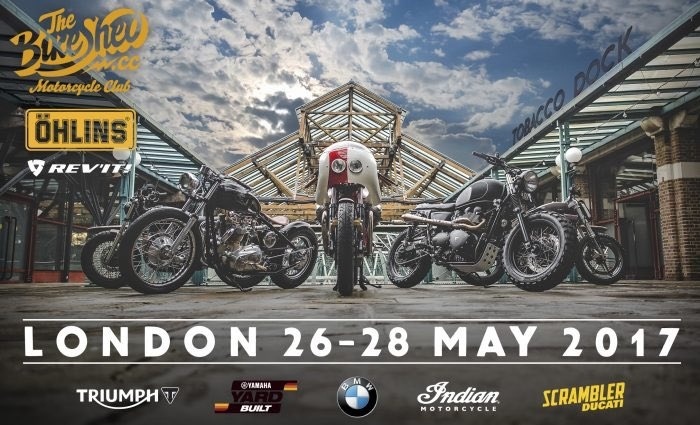 Supported by the mainstream motorcycle industry, the event is sponsored by Ohlin's suspension, Rev'It apparel, and motorcycle manufacturer's; Triumph, Indian, Ducati, Yamaha and BMW, all exhibiting alongside other manufacturers, pro-builders, amateurs and shed-builders alike.